Fourteen-year-old twins Grace and Connor are left orphaned and penniless in a gossipy old village and so both flee the clutches of their would-be guardians. They take a dinghy out to sea only to be cursed by a storm and separated from each other. 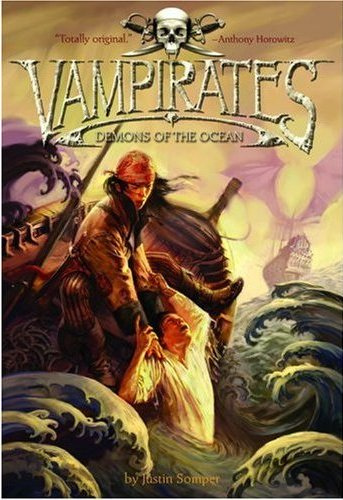 Connor is rescued by a pirate ship while Grace is saved by a dreaded Vampirate, the terror their father had warned about in a catchy but strangely comforting shanty. Despite being oceans apart, both siblings never give up hope that the other is alive and focus their energies into finding each other. Meanwhile, Connor carves a new life as a pirate while Grace faces dangers from the Vampirate crew who have yet to know of her existence on board. What better way to curdle your RBCs but merge two devils into one — pirates and vampires! Hence, vampirates! Quite an original concept and a rather great way to grab the reading attention of very young readers, from nine to fourteen years old. Well, it caught my attention and I’m no spring chicken (Hey, I’m no geriatric either, LOL! ; but, I’m way over my teen years. How old? Let’s just say I’m supposedly too old for YA. Tee hee!). Since the book was written with this reading market in mind, I must review from this viewpoint and pretend to be twelve. If I were twelve, I would love this book and cajole mom to buy me the series. It starts out strong with a good ditty and two engaging twin characters. The vampires are interesting creatures and quite different from the usual. There are normal pirates in the book as well; and well, they are the usual jolly, swashbuckling lot, quite appealing to young boys. An innocent, budding romance is also in the air for girls just discovering the world of crushes. Somper’s writing is just right for the age bracket but his style and the plot may be a little too juvenile for adult tastes. Still as an “oldie”, I was entertained and finished the book in a day. One thing I am puzzled about, though, is the fact that the story is set well into the future, specifically the year 2505. However, with the mention of swords and galleons and the utter lack of modernity in the story, the whole thing really feels a lot more sixteenth century”ish”. In fact, you would forget the story’s futuristic date. Maybe this question is answered in the sequels? This is a series book, as most YA books are. To date, there are five, the latest being Empire of the Night, which according to Amazon, will be out in August 2010. Definitely read if you’re a kid or when you’re just too bored being an adult. Just remember that this series isn’t over yet with the fifth. I’ve read the first three books, and at least up to that point, the question of the date is never really answered, but it always distracted me, too… why not just set it in a fantasy world without bothering to specify it as Earth’s future? Hmmm…maybe the author forgot his future setting. Now, that it has been published, he can’t take it back. LOL! Hi, Jo! Thanks for your review! I’ve always been curious about this series. It sounds like a fun read. Although, I don’t know if I can manage to read all of the books in the series, considering that I’m already following a lot of YA chapter books. Hehe. I wonder why most YA books have to come in a series. This is why I mostly stay away from them. But then, they have such interesting stories. Looks interesting, at least it’s not another sappy vampire story. I’m all for the swashbuckling. And it’s British! I think I’ll like this one. There’s a little sap but I’m betting you’ll still enjoy it, Blooey. I listened to the first book in this series. I enjoyed it but didn’t rush out to get the next one. It was fun, light read. I just figured it was some other world and or at some point in the future technology is lost and we return to more post industrial revolution ways. Guess we could think this or just forget the author ever mentioned a date. I’ve just been to your blog and your cookies caught my eye. I’ve added you to my blogroll for my diet of YA and cookies! 🙂 Thanks for dropping by, WonderBunny.